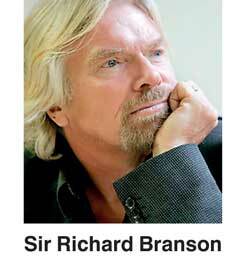 “Clearly, there is so much potential [in Sri Lanka], and that’s the one thing that any entrepreneur seeks out, because it’s the perfect storm in business – commercial gain, and the chance to transform lives...” says Sir Richard Branson, in a wide ranging interview published in the May edition of leading business magazine LMD. His decision will rest predominantly on whether or not he and his vast team of advisers and aides feel that Virgin can produce a product that will positively impact the lives of those people, LMD asserts. “If you take Sri Lanka as an example, you look at the conditions, what the market looks like and assess it. Where is the gap you can fill? Once you identify something, you can find the best possible people to work on it, to make it a reality – and then go for it,” he states. The May edition of the pioneering business magazine will be released to leading supermarkets and bookstores today (for the full story, log onto www.LMD.lk).